Todd Hamilton is the North/Central/West Texas, Oklahoma, and New Mexico Regional Manager for Distribution International (www.distributioninternational.com), and is the Chair of NIA’s Metal Building Laminators Committee. He can be reached at t.hamilton@distributionintl.com. buildings. When using laminated fiber glass, it is important to choose National Insulation Association (NIA) Certified Faced Insulation to guarantee that the stated R-Value of the product can be achieved. What Is Certified Faced Insulation? Is All Metal Building Insulation Certified Faced Insulation? Only Certified Faced Insulation is guaranteed to have an assured R-Value to achieve the stated performance level of any installed insulation system. The lamination process of applying adhesiveness and a facing to the fiber glass insulation can condense the insulation and greatly affect the thickness recovery of the insulation and its effectiveness. Certified faced insulation regulates this and the other quality issues. Specifying a certified product with an assured R-Value helps builders achieve the stated performance level of an installed insulation system. The program was designed to help the industry ensure consistency and help meet energy-efficiency goals. What Makes Metal Building Insulation Different from other Types of Building Insulation? insulation systems that seek to save energy and thus lower costs. Certified Faced Insulation is evaluated by Home Innovation Lab Certified™, a third-party certification program that has field representatives conduct periodic visits to lamination facilities to randomly collect and assess product specimens. As the vapor retarder is unrolled, adhesive is mechanically applied prior to the fiber glass blanket being married to the vapor retarder. Typically, as they are joined, they move between a roller applying pressure to each; this ensures a quality bond is made. 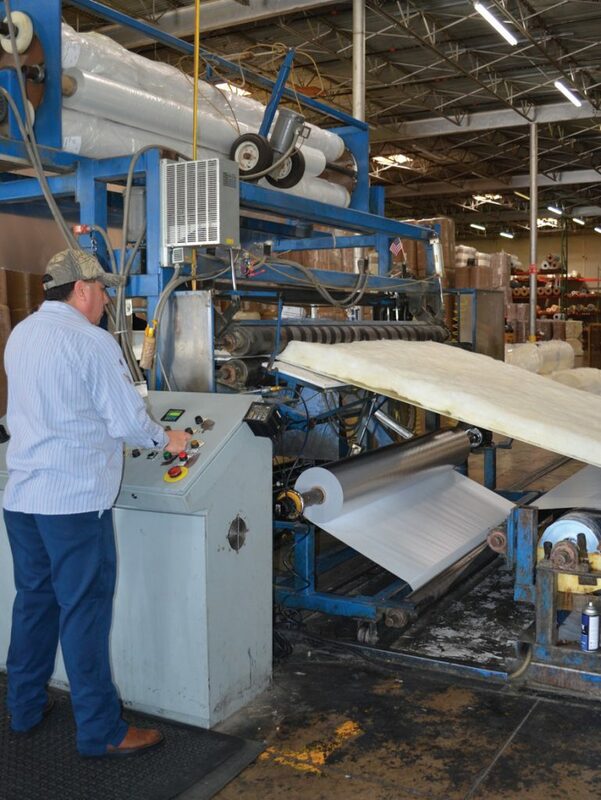 After passing through the roller, the product is rolled back up under compression into a finished rolled product; it is then packaged, labeled, and prepared to be shipped. What Are the Key Components of the Lamination Process? See the full NIA Certified Faced Insulation Standard on page 14. PURPOSE: A standard product specification for use by manufacturers, laminators, designers, and users of metal building insulation systems. 1.1 This specification covers the classification, composition, and the physical properties of flexible faced fiber glass insulation intended for use in the walls and roofs of manufactured metal buildings. 1.2 The thermal insulation values in this specification are for the insulation only and do not include the effects of facings, air film surface resistances, compression of insulation at the framing members of the building, through-metal conductance of fasteners, and other parallel heat transfer paths due to design or installation techniques. 3.1 The flexible insulation is furnished as glass processed from the molten state into fibrous form, bonded with a thermosetting resin and formed into a resilient flexible blanket or batt. A suitable vapor retarder facing is adhered to one surface. 4.1 For definitions of terms relating to insulation, ASTM C168 shall be considered as applying to the terms in this standard. 5.1 Material shall be ordered by specifying thermal resistance (R-Value), insulation length and width, type of facing, permanence of facing, facing tab width, and number of tabs. 6.1.1 Thermal Resistance Tolerance: The resultant tested R-Value shall meet the labeled R-Value. 7.1 The material shall indicate good workmanship and shall not have visible defects which adversely affect its serviceability. Vapor retarders should not be torn or punctured. Tears and punctures shall be repaired or replaced. 8.1 The laminator’s normal sampling and inspection procedures shall be acceptable as outlined in Section No. 4 of ASTM C390, unless agreed otherwise. 9.1.1 Sample Preparation: A representative roll of insulation, at least 25 feet in length, is rolled on a flat surface. When roll lengths are in excess of 75 feet, it is permissible to cut the roll into 2 equal lengths for ease of handling. The test roll is then flipped over for its entire length. Finally, after grasping one end, the material is pulled back over itself until the original surface is again facing up and allowed to rest for 15 minutes. 9.1.2 Test Procedure: 5 thickness measurements are then taken, using a pin and disc gauge per ASTM C167 on each third of the roll starting 5 feet in from the roll ends. The 5 thickness checks, should be spaced uniformly over each third of the roll, sampling the full width but not closer than 1/10 of the width from edges. 9.1.3 Calculation and report: Calculate the average of 15 thickness recovery checks from the roll. The average thickness recovery value can be used to calculate the thermal resistance in 6.1 providing the thermal conductivity of the material is known or has been supplied by the manufacturer. 9.2.1 Sample Preparation: A representative roll of insulation is completely unrolled on a flat surface. 9.2.2 Test Procedure: A steel measuring tape of sufficient length shall be used to measure the entire length and width. An alternate method may be used where the flat surface has been previously ruled out to facilitate ease of measurement. 9.2.3 Calculation and Report: Determine the length and width in several locations and report the average values. 10.1 Inspection of the material shall be agreed upon by the purchaser and the supplier as part of the purchase contract. 11.1 If inspection of the sample shows failure to conform to the requirements of this specification, a second sample from the same lot shall be tested and the results of this retest averaged with the results of the original test. 11.2 Upon retest as described in 11.1, failure to conform to this specification shall constitute grounds for rejection. 11.3 In case of rejection, the laminator or seller shall have the right to inspect the rejected shipment or resubmit the lot after removal of that portion of the shipment not conforming to the specified requirements. 12.1 Samples of this product are tested periodically by a nationally recognized laboratory, and determined to meet the stated dimensions and thermal resistance in accordance with the NIA 404 Standard. The laminator shall represent that his/her product has been produced to the same standard as samples tested. 13.2 Thermal Resistance Tolerance: The unfaced fiber glass insulation shall meet the thermal resistance requirements of NAIMA 202-96 (Rev. 2000). 14.1 Unless otherwise specified, the package shall be marked with the seller’s name and designation, length, width, thickness, R-Value, total number of square feet, and manufacturing date code. The package shall also be marked with the label of the certifying laboratory. 14.2 Unless otherwise agreed or specified between the purchaser and the laminator or seller, the insulation shall be packed in the laminator’s standard commercial container. 15.1 The material shall be stored in such a manner as to protect the package from direct sunlight, weather, temperature extremes, moisture, water, and extreme compression. 15.2 Shelf life shall be agreed upon between the seller and the purchaser. 16.1 Long service life and optimum performance characteristics of fiber glass insulations are predicated on the requirements that dry insulation be applied to clean and dry surfaces, and that they be protected against incursion of water during installation, and protected against incursion of water by adequate design and maintenance after installation. 16.2 Wet insulations have poorer thermal performances than dry insulations. In service, it is difficult to dry wet insulations completely. The incursion of water may also introduce compounds and organisms which may accelerate corrosion of metals and may permit mold or mildew growth and odors. 16.3 Tests conducted under laboratory conditions on relatively small specimens of fiber glass artificially wetted with distilled water in the liquid phase and thoroughly dried under conditions free of shear or compressive forces indicate no adverse effect on the apparent thermal conductivity. This would suggest that insulation wetted in service could regain most of its thermal resistance provided it could be dried without a significant loss of thickness. However, there is no assurance that the drying method used or the forces acting on the wet insulation will not result in loss of thickness or that contaminants in the water may not contribute to corrosion, mold or mildew growth, or odors. 17.1 NAIMA Insulation Facts #28 provides recommendations for laminators to help metal building insulation meet stated R-Values after lamination.